The Kiwi hunting culture has been in my thoughts lately, (better buy a bigger couch BoB), partially prompted by the aforementioned writings of Mr Crump, and by the copy of NZ Outdoor Hunting our mum brought back from a recent visit to see BoB, Mrs BoB and the Princess E (AKA the Littlest BoBster). There’s an adage in bushcraft that ‘there’s no such thing as bad weather – just inappropriate clothing’ reports seem to suggest that these words may if fact form part of the New Zealand constitution. As they say on the south island ‘if you can’t see the top of the mountain it’s raining, if you can see the top of the mountain it’s about to rain’. If ever there was a country generously endowed with mountains it’s NZ, they have their own Alps where Sir Edmund Hilary trained for his successful attempt on Everest. If you’ve seen The Lord of the Rings you’ll have a good idea of what the place looks like. If you’ve seen the ads currently running on UK TV you’ll know why I’m so keen. Viewed at a distance of half a world away the place seems to have a romance the suburban bush just lacks - I go fishing across town by scooter; they go fishing across mountains by helicopter. The hills they hover over are alive, not with the sound of music, but with the thunderous hooves of Red Stags and Elk. It’s so alive with them that the Rut is called ‘The Roar’ and the Kiwi’s have their own collective noun for deer – ‘a mob’. There are other linguistic differences ‘Alright mate’ is a greeting not a proposition, and all utterances sound like questions, with rising intonation at the end of the sentence. BoB has enthusiastically taken on this linguistic tic, much to the amusement of his family and friends. Despite being a native daughter of New Zealand Mrs BoB speaks perfectly normally. To read about it the place sounds like a nation founded by hunters, the Maori people brought pigs with them during their invasion and colonisation of the islands, and so did the British. These creatures have re-wilded themselves in the bush and grow to some pretty impressive sizes. Deer, Elk, Hare, Turkey, Pheasant and Mountain Goats have all been introduced and with no other predators are putting unsustainable pressure on the environment. So once again the ‘culinary solution’ must be deployed to save the environment! Yummy! The contrast to life in the city was brought home to me when I saw that NZ Outdoor Hunting had published some pictures from the memory stick of a camera that was found in the back country, secure in the knowledge that someone would recognise the guy in the pictures and organise its return to him. Are these the nicest people in the world? What do you call a polite Australian? Will these crudely drawn stereotypes prove to be true? I’ve been away travelling with work for the last few weeks so apart from (unsuccessfully) hunting road kill from the car window I’ve not had the opportunity to do anything even remotely blog worthy, apart from catching up on some reading. Mrs BoB has long been telling me how much I’d love the work of Kiwi legend Barry ‘crumpy’ Crump(1935-1996) and was kind enough to send me a compendium of his works. How right she was. Crump has a sparse writing style (big type - not many words on the page) and manages to sound as though he’s sitting next to you by the crackling camp fire. He undoubtedly would have made great company. I want to make Crump the patron saint of making do with crap kit. This was the age of canvas tents that weighed more that a suburban dad after a big lunch, waterproofs that weren’t, boots that were ‘half way to worn out before they were worn in’, and help that was more trouble than it was worth. 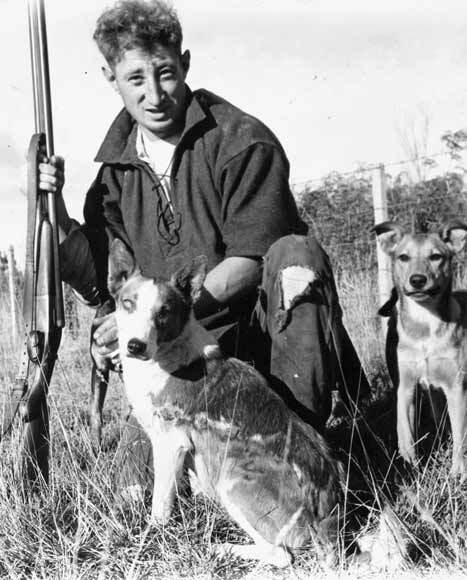 At the time of writing his first book ‘A Good Keen Man’ he was a youthful deer culler on New Zealand’s south island during the early fifties, when deer numbers reached such epidemic proportions that the government had to send guys armed with war surplus 303’s (iron sights – no scopes) out into the back country to dramatically thin out their numbers before they ate the vegetation down to the rock. ‘Three rounds per skin you bring in, after that you pay for them yourself’. ‘I’ll be along to see how you’re doing in a couple of months, weather permitting’. Before hunting could commence Crump and who ever he was working with at the time would have to cut their way through the bush to get to ground they were going to hunt that season. So it was only after a few weeks limbering up with a little ‘light’ forestry that the actual work they were paid for could begin. Leaving camp before dawn and returning in the dark often with only his dogs for intelligent company, enduring the south islands notoriously changeable weather and rough terrain. The job would certainly be a tough and lonely endeavour, so it’s not surprising that the deer cullers of this period have an almost mythical place in Kiwi hunting lore. This was hunting on a scale, and in a style, that is almost unimaginable today. All deer were fair game and once there was enough meat for the table, only skins were brought back to camp as proof of kills. I’ve never met anyone who has got twenty deer in a year, Crump and his more effective co workers were getting twenty in a day. Each. A different kind of conservation effort to what we’d practice today, but without it New Zealand would now be bare rock. The way he tells it, from his first season Crumpy was something of an asset to his manager, by the time he’d been in the job a couple of seasons he was shooting so many deer that he burned through a rifle barrel in a season! As usual top performers must be kept on their toes so despite his Herculean (or should that be Sisyphean?) efforts he wasn’t allowed to rest on his laurels. When he put his reports in he was expecting some modest recognition of his efforts only to be told ‘you could have done a bit better if only you’d put a bit more effort it’. Same old same old! His boss was the kind of shameless huckster that would have been at home in any of the sales offices I’ve worked in; always trying to get more numbers out of young Crumpy, and issuing empty, yet beguiling, promises of help on the way (if only he could ‘get the *&^@:$% numbers up’ in the meantime). The ‘help’ promised would occasionally be waiting for him when he returned to camp at night. Fresh faced and ill equipped both between the ears and in the rucksack. Wilmer: That evening, while I baked a couple of loaves of bread, Wilmer proved beyond all dispute, by brilliant deduction, that queen Victoria was perverted, that one of his own ancestors wrote under the name Shakespeare, that Winston Churchill was an impostor, and that the present birth-rate in Indo-China would make the world so top-heavy that in ten years it would start to wobble and eventually spin in a north-east by south-west direction. I believed all this and finally went to sleep with my head reeling from all the startling bits of information that had been poured into my unaccustomed ears ………[ I’m not going to spoil this bit for you - its hilarious] ………….If this was one of Jim’s good keen men I was going to ask him for a woman next time. A succession of these ner-do-wells, dreamers and egotists rock up at his camp, only to find that they don’t really have what it takes to be a poor lonesome deer culler a long way from home after all. Any complaints about the time he’d wasted on their basic training would of course be met with further promises of having found just the guy to replace the last bloke, ‘totally different story - you’ll like him, he’s a good keen man’. Hilarious! !